There are many stainless steel bowls on the market, but none like the Snap'y Fit Bowls! The Snap'y Fit patented system holds the bowl firmly in place and yet, allows easy removal. Pet parents have been frustrated for years with conventional water bowls because pets can dislodge the bowls and spill the food and water. The Snap'y Fit patented system solves this problem by locking securely in place with the grommet hanger. The bowls are available in 10fl. ounce, 20 fl. ounce, 4 fl. cup & 8 fl. cup (1 and 2 qt.) sizes. 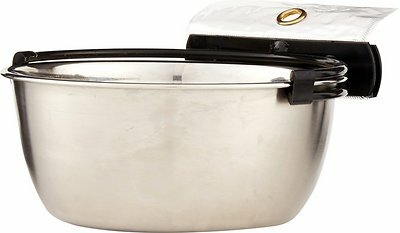 Patented Bracket Locks and Holds durable Stainless Steel bowl in place – allows for easy removal. Made with quality, rust-proof brushed stainless steel. Made to last and stand against the test of time. MidWest Homes For Pets® offers a wide variety of accessories, so you can create a crate that's comfortable for your canine companion. Help your dog feel right at home by adding final touches to his space like secured dog bowls for mealtime, privacy covers that turn his crate into a low-lit sanctuary or high-quality doggy beds for added cushion and luxury. MidWest Homes For Pets® Snap'y Fit Bowl makes crate time meals easy for your pet. The patented bracket attaches to the sides of your dog's crate and helps reduce messy spills by keeping the bowl secure and elevated as he chows down and hydrates. It's made of stainless steel to help prevent rusting and it comes in four sizes, so you can find the best possible fit for your best friend. Even dogs desire a little peace and quiet every once in a while. That's why QuietTime® Crate Covers are a great addition to almost any MidWest crate. Choose between a geo-print with Teflon™ fabric protector or classic black polyester for extra privacy. The lightweight covers offer plenty of air-flow and can fit crates with up to three doors. They're even finished with hook and loop tabs to keep them securely in place. MidWest QuietTime® dog beds provide pups with the perfect place to rest their head. They are made to fit inside most MidWest crates and help create a comfortable space for canine companions. These plush beds are available in multiple fabrics and finishes, giving pet parents an array of options to choose from. Your dog will love the high-quality, soft materials that MidWest beds have to offer. MidWest Homes for Pets® is a fourth-generation family-owned company with a firm belief that pets are far more than animals you care for, they are a part of your family! Our belief that pets are a part of the family has allowed us to remain in business since 1921! We are dedicated to providing quality, trusted, and tested products supported by superior customer service. Our tagline–Because Life Goes Better with Pets®–states something we genuinely believe; we take pride in offering the best for your family. These look good in the catalog, but when they arrived I found it darn near impossible to get the bowls to pop into the tightly curved holder. My pup was able to unseat them immediately. All his water spilled in his crate. I fail to see how I am supposed to place a filled food or water dish in without spilling it. The bowl is shown fitting its lip between the two arms of the holder. I have never been able to reproduce this. My dog's food was previously kept out on a tray in the floor with her water but after getting a cat who likes to eat everything, I had to move it. I found that sitting her bowl inside her crate just wasn't working because she would spill it so I tried this bowl. It works so well! It's easy to put up and with a very minor adjustment to the arms that hold the bowl it works perfectly! No more spilled food and no more fat cat eating her breakfast. Could use some improvement, but awesome! these are great. Their food stays clean and won't tip over if they place their front paws on the dish. Plus for those rabbits that love to chew they won't hurt themselves or want to chew on this.. I use one size for their pellets, one for hay and the smaller one for fresh greens. Its easy to remove, and put back. They hold in tight and by aliening the edge of the bowls with the openings of the holder, push firmly and it goes in to stay until you pull it out. My heeler mix was dumping over or destroying every other dish we had gotten her. A mix of separation anxiety and trying to bury her food mixed with her simply pitching a fit caused the destruction of 7 other kennel bowls. Enter this one she cant move it destroy it or chew on it I am so happy ! Yes it's hard to get in or out but once you get the hang of it (some twisting and bending) it gets easier but it it wasn't so solidly in there my dog would still be dumping it over. Bowls like this have been around for a long time. It’s nice to finally use one where the bowl comes out without taking the hardware apart and off of the crate. The bowl itself is good quality. The “clip” can be tricky to get tight if you don’t use the plastic piece that’s included. Line it up correctly and you’re good to go. This bowl is great! Nice and sturdy. Attaches tightly to the side of the pen. Bowl snaps on tightly. Great for a food bowl. I bought it for a water bowl. If you are using it for water it needs to be unscrewed from the pen completely to empty it (unless it is already empty). Otherwise the water dumps everywhere. The design of the attachment to a cage is great. It fits on very secure. The problem is that the bowl fits too tight into the holder. I struggled for over 10 minutes to try to pull the bull out of its holder. When I finally got it out, I couldn't get it back in let alone filled with food or water. It seems that the holder was redesigned, and this may be the new design. While the old holder had complaints about it being sharp, this is rounded. However if you can't get the bowl in or out easy it makes it very hard to use. I would not recommend this product.